You may remember from an earlier post that I was experimenting with using a pendulum to drive to a character sitting on a box swinging his legs back and forth. 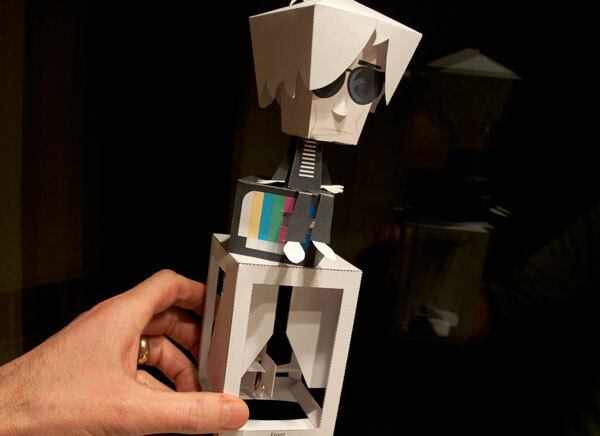 At around the same time Matt Hawkins from Custom Paper Toys released his fabulous model Paper Pop which features Andy Warhol sitting atop a tv. Rather than reinventing the wheel, I contacted Matt and he very kindly agreed to let me hack his model and add some mechanisms. So here's the first draft. The tv and up is Matt's. The box below is the bit I've added. It uses a coin weighted pendulum to drive the legs back and forth via a couple of linkages. You can just about make out the hole in the screen behind the legs. 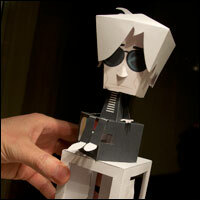 I've also changed the way the head is attached to the body so that wobbles when the box is moved. Coming along nicely. There are a few small changes to make but its working rather well! Andy certainly would like to be immortalized by Rob Ives…Match point!